Happy Friiiyaaay! Welcome to the weekend. Almost. Pretty much, though, right? I’ve actually been saying this since Wednesday. You’re over the hump, so it’s basically the weekend. YAH! But seriously: today actually counts as weekend. Are you guys doing anything fun? CAN I COME!? Jk. I have STUFF TO DO! But have fun! We’re being weird this morning. This is what happens when I only get 7 hours of sleep instead of my usual 9. Yeah, I’m still sleeping 9 hours each night (unless I set my alarm for some awful reason and have to get up). I was *supposed* to schlep myself over to the DMV this morning and FINALLY get an Oregon driver’s license. I’ve been waiting for YEARS to get an Oregon ID again! I nearly cried when I had to get a CO ID after college. Oooh sad day. So now that I’m back I can be reunited by my Oregon ID LOVE! And I’m being lazy about it. No excuses other than my laziness. NEXT WEEK! I’ll go next week. Right? Right? 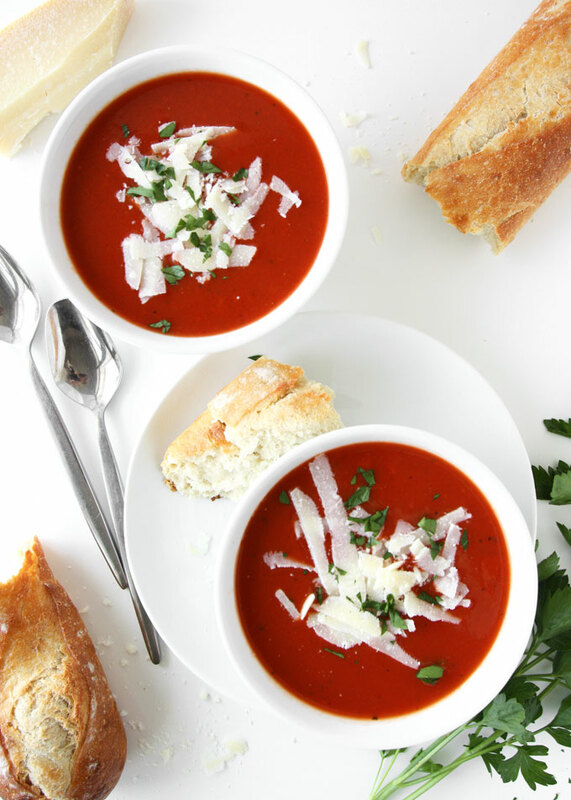 Here’s what I WILL be doing next week, and every week all summer/winter/forever: making this tomato soup. This is my FAAAVORITE tomato soup. 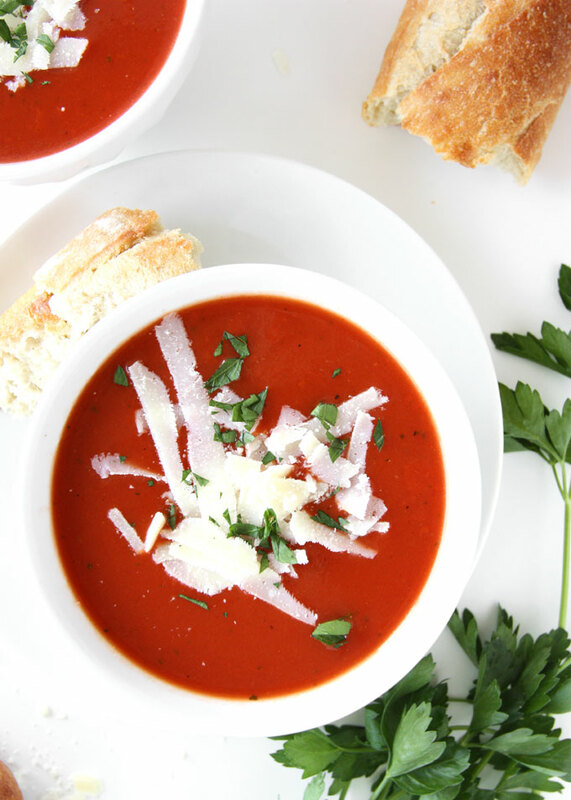 It’s the recipe my Grandmother makes — and since she and my Mom grow so many tomatoes each year she makes it year round with “fresh” tomatoes from the freezer! It doesn’t have any cream. It’s super flavorful and smooth. It’s pretty quick to make. And did I mention it’s yummy? It is SO yummy! To get it smooth, you’d ideally have a food mill. I have no such thing. I poured mine through a fine-mesh sieve and it worked out fine. You could leave the chunks in … but I don’t recommend it. 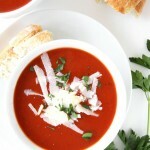 I’m usually not a stickler for things like that, but I think tomato soup NEEDS to have that silky smooth texture. Give it a go! 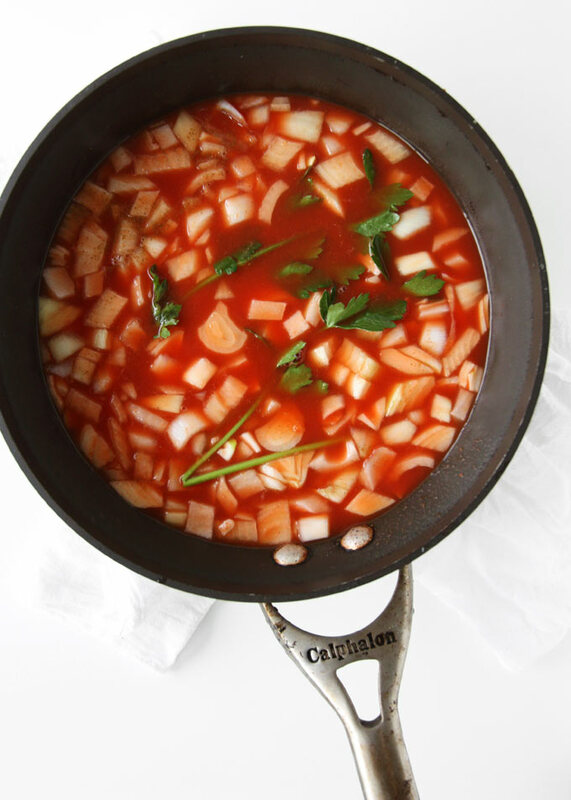 In a heavy pot over medium heat, add the tomatoes, onion, celery, parsley, and bay leaf. Bring to a simmer and cook for 15 minutes. Remove the bay leaf, and blend the soup until smooth. Put through a fine mesh sieve or food mill. Rub flour and butter together into a smooth paste, and thin with a cup of the tomato mixture. Add to boiling soup and stir constantly. Boil for a couple of minutes to cook flour. Once the soup is thickened, add the salt, pepper, and sugar. 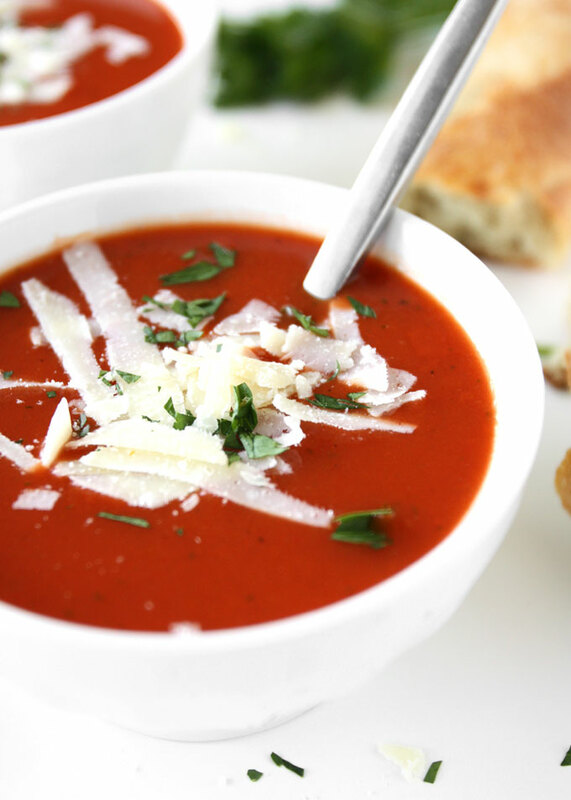 Serve immediately, topped with fresh parmesan cheese, or store in an airtight container. I used diced canned tomatoes, which I blended before starting the recipe.